As the Ebola virus lands closer to home, it has been disappointing to watch the hype, inaccuracies and blame circulating in various media on what continues as a yet-to-be controlled humanitarian and health crisis in West Africa. Those who have been aware of this evolving issue, such as many well-trained, conscientious infection prevention professionals around the country, know this disease has been threatening the West African countries of Liberia, Sierra Leone and Guinea with increasing magnitude since March of this year, taking the lives of far too many West Africans over the last 7+ months. As a result, Ebola abroad, and now for the first time in the US, is also a very dynamic situation, like much in healthcare. As such, responsible healthcare journalists, weekend warrior bloggers or persons with a Twitter account might want to take into account that as more is learned, protocols and best practices will, as expected, evolve. Fast Company staff writer, Rebecca Greenfield (@rzgreenfield), in Ebola Deeply is the Only Place You Should Be Getting Ebola News, directs those in search of Ebola related content without the hype, turn to the single source news website, Ebola Deeply, started by Lara Setrakian (@Lara) a former ABC News and Bloomberg reporter. After clicking onto the site, readers are immediately drawn to the NYTimes video story by video journalist, Ben C Solomon, also embedded below. The story shows what life is like on the streets of Monrovia for Gordon, a Liberian Ebola ambulance driver, separated from his family as a safety precaution for over five months. What he describes sounds like going to war against an invisible opponent, with limited armor and safe harbors. Certainly in a resource rich country like ours, we should be able to handle what courageous true front line Ebola warriors are fighting with much less. And with the arrival and death of an infected patient to a Dallas hospital, and the subsequent infection of two nurses who treated him, many of the existing cracks in our healthcare system are being exposed by the media on the larger stage that is now practicing medicine. In an interview on the Today Show last Thursday, a nurse working at the hospital spoke with Matt Lauer, sharing the need to come forward knowing full well she might lose her job. Not knowing the full story, the fact that this could happen comes as no surprise to those working in healthcare. However, it is important to note we still have one of, if not the, very best systems in the world–cracks and all. A safe healthcare system has a just culture, and when a nurse “voices concern” about his/her own safety, as well as that of patients and colleagues, he/she is heard, even thanked, by those who can fix and address those concerns. Many healthcare organizations across the US are creating environments that welcome this voice, yet others are still far from adopting this culture. While not at all familiar with the culture at this particular hospital, nor the institution’s side of the story, it appears from the Today Show interview this nurse voiced concerns that initially went unaddressed. To this end, we see how failure to embrace elements of a just culture could affect patient and provider safety in real-time. This could be an unfortunate example of a long existing need for greater urgency around culture change in healthcare. …the Ebola crisis is challenging us in many ways and will likely continue to do so for quite some time. But perhaps we’ll emerge from this with a more thoughtful approach to patient care that improves safety without sacrificing quality. Earlier this year, the NYTimes posted, 2013: The Year in Interactive Storytelling, a stunning compilation of last year’s best NYTimes interactive stories, covering topics as disparate as rising healthcare costs, Spring Fashion week, the growing art markets in China, and a murder investigation in Florida. What each story shares, however, is the use of a combination of print, audio, graphics and video to tell the tale. In a 2013 ETY post, Telling Healthcare Stories via Multiple Media, our readers had a brief glimpse at this new form of storytelling from the NYTimes via Snow Fall: The Avalanche at Cedar Creek. Following are a few of my favorites from the “Best of 2013”, but if you have time, every story I’ve clicked through has value for the budding non-fiction storyteller looking to find new ways to share content. Using interactive infographics in Front Row to Fashion Week, NYTimes artists make the sea-foam, lime green and fire orange designer-favorite colors of Spring Fashion week explode from the screen, even allowing viewers to drill down for a closer look at each of Oscar de la Renta’s spring floral cocktail dresses as though they were shopping the streets of 5th Avenue. 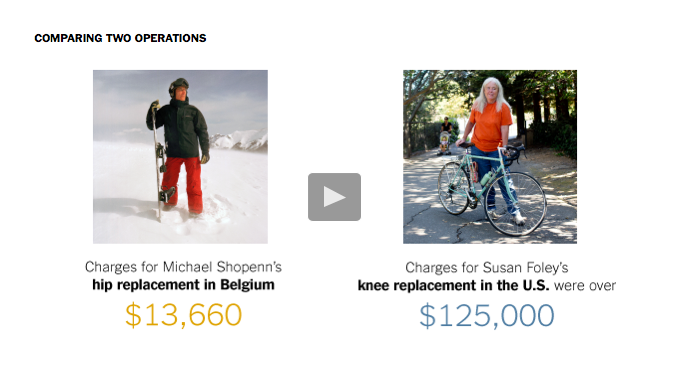 In Paying Till It Hurts, authors, artists and filmmakers use interactive graphics as well as video to show the difference between the cost of a hip replacement in Belgium ($13,660) and a knee replacement in the US ($125,000+). By clicking on the arrow in the center of the image within the NYTimes story, the page comes to life as Michael and Susan share two very different healthcare experiences. In A Culture of Bidding: Forging An Art Market in China, a beautiful interactive graphic reveals multiple pieces of Chinese art sold at auction, such as “Eagle Standing on a Pine Tree,” a 1946 ink painting by Qi Baishi, a Chinese master, which sold for $65.4M. This piece, like many others, remain in storage unpaid for by the winning bidder, as the authenticity of the pieces are questioned by those afraid to sign the final check. In Two Gunshots on a Summer Night, the use of moving images along with 911 audio tapes and police interviews make the shooting death of a police officer’s girlfriend all too real for viewers, putting the guilt or innocence of the suspects on display for closer evaluation in ways unattainable by print alone. Interactive storytelling is the future. It’s costly and much more time-consuming than a typical piece of journalism–and it’s a considerably collaborative effort versus the solo journey of a reporter. The results, however, make viewers feel as though they are there in the moment getting to know the subjects and stories in real-time, forming bonds and attachments to the characters on a much more personal level. I look forward to what the NYTimes has in store for the future! Our ETY storytelling series often includes tips and examples of good storytelling for healthcare leaders who wish to embrace the power of story to change healthcare for the better. At #SXSW this past week, I attended more than one session focused on the power of story in both brand building and filmmaking–all of which provided takeaways easily incorporated into the work of telling our healthcare stories. 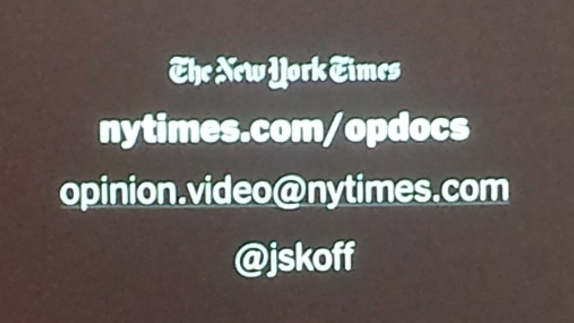 One such session was put on by the NYTimes Op-Doc producers. Op-Docs is a series of short films submitted by both established and up-and-coming filmmakers, covering health, the arts, science, world news, tech, sports, opinion and more. One of the Op-Docs short films covers an interview with writer/director/lead actor Jon Favereau (@JonFavreau) for the movie Chef, which premiered at #SXSW. The film, which includes an all-star cast, inspires the audience to do what they love–one of my Top 10 Takeaways from #SXSW2014 to come in a post next week. In a #SXSW session dedicated to a conversation with the filmmaker, Favereau told the audience he used to work on Wall Street and was sadly uninspired, giving to the job only what he absolutely had to in order to get through another day. It was when he committed to a career in filmmaking that he found his passion, along with the desire to put all of himself into his work. As evidence of that commitment, he shared that he wrote the script for Chef in only 2 weeks, explaining how the story took hold of him and he couldn’t stop writing until it was finished. To hear more of his thoughts on the film and his own filmmaking process, view the NYTimes Op-Docs interview with Favereau at NYTimes Op-Docs Chef. And go see the film if you get the chance — it’s truly one of those “feel good” movies! Check out NYTimes Op-Docs for storytelling ideas here, but beware…the content will pull you in, and keep you on the site far longer than intended. The most amazing example of new journalism was forwarded to me the end of last year. The NYTimes produced a piece entitled, Snow Fall: The Avalanche at Tunnel Creek that was like no other piece of mass market journalism I’ve seen to date. WIRED magazine’s tablet issue has also pulled in multiple mediums in similar fashion, but I do not believe on the same scale, and with animation tied directly to the text, in the same way. The video that follows is from the Snow Fall piece–one element within the online story, along with additional video, animation and graphics that not only tells the tale of that fateful day, but also takes the reader on a visual tour of Tunnel Creek, following the path of the snowboarders and skiers as they make their way to, up and down the mountain. This is the form, and an example of the multiple skill sets, telling stories of the future will require. As a result, what is in store for all of us as readers/viewers is exciting. A Creator’s Guide to Transmedia Storytelling by Andrea Phillips, sits nearby on my desk, waiting for a few free moments to be read so I can learn some of these new techniques. I’ll be sure to review it for our ETY readers, as the million dollar question for me is: How can we in healthcare best embrace the marriage of multiple storytelling mediums along with the available technology to share stories that encourage healing and wellness–both mental and physical? Some, like Jane McGonigal, TEDTalk alum, game designer and recovered head trauma patient, has found that many people believe reality to be so broken that they turn to the stories within good games to find ways to heal and then face the world. Her book, Reality is Broken, is another on my 2013 reading list. In healthcare, we are gifted with the opportunity to be with people at times they are most broken, and the ability to share stories of those who have been through similar illness or trauma can provide a lifeline not currently taught in health science training. Whatever the extent to which you believe reality is broken, its imperfections and boundaries give us material to work with as we craft stories that help others relate to one another and gain strength once again. Add a dash or two of good stories and storytelling technique to health prevention messaging–which research has already shown can influence health behavior (see The Power of Storytelling in Medicine) — and maybe we can keep people out of the hospital altogether. The more absorbed the reader is in the story being told, the more likely he or she is to be changed by it, according to his research. We know that stories shape entire societal belief systems–and Gottschall uses the example of how we once believed the world was flat. Until Columbus discovered America, people lived in fear of falling off the end of the earth. How powerful is story? It’s true the business sector has known for some time that stories sell–entire marketing departments are built upon this belief. But now, science and medicine are slowly catching on to the power of story to create the change that has stymied healthcare leadership, organizational and behavioral psychologists. We know the proposed steps of behavior change, and have for a while, yet the instance of obesity in the US continues to hit record highs. Maybe getting patients to make that critical move from pre-contemplative to contemplative stage is where story can be most effective. 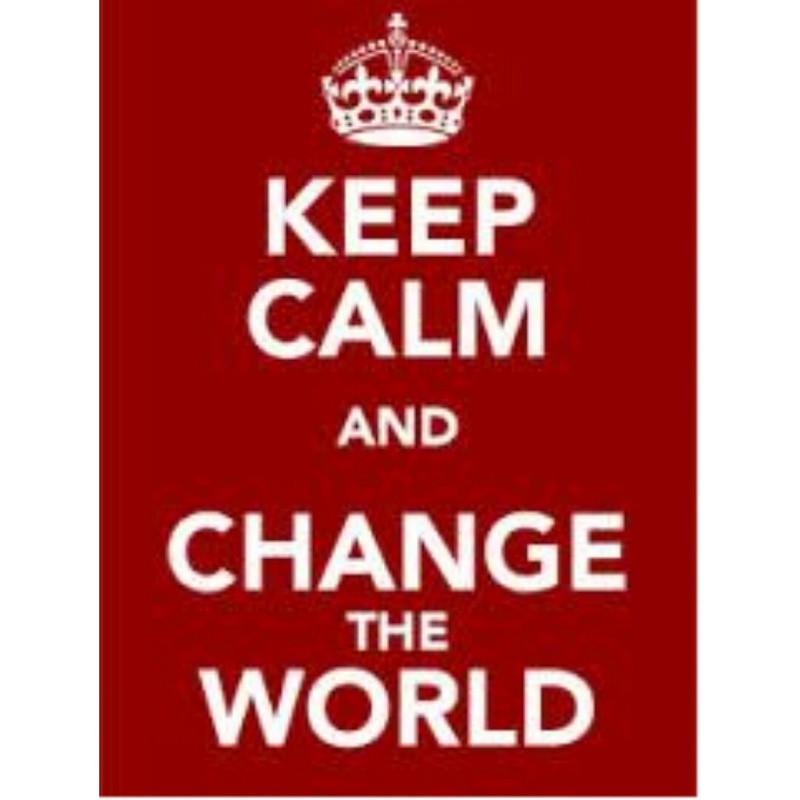 After all, how do you help someone recognize they need to change? Tell them a story they can relate to–at least researchers and the media increasingly seem to think so. Patients are sharing their own stories on the NYTimes Well Blog, connecting with others around the US struggling with similar health challenges. Researchers like Amy McQueen and colleagues from Washington University in St. Louis looked to better understand the effects of breast cancer survivors’ stories on African American women in their 2011 Health Psychology study, Understanding Narrative Effects: The Impact of Breast Cancer Survivor Stories on Message Processing, Attitudes, and Beliefs Among African American Women. And McQueen is far from the only researcher beginning to measure the effects of story in medical populations, as the body of research in this area continues to grow. Anecdotally, we have had similar results with our Tears to Transparency film series. By sharing Lewis Blackman’s and Michael Skolnik’s stories of patient harm with other care providers, medical students and residents in order to prevent similar harm from occurring, we have watched in awe the transformation that occurs in the room when the credits roll and the lights go back on. These stories stimulate conversation around medical error that creates change in the moment. We need to study this, and evaluate how lasting an effect these stories have, and whether or not a booster shot of story is needed, and how often. Story indeed appears to hold promise for medicine, and healthcare in general. Why don’t people exercise as they should? Or eat things that are good for them? It’s not about the data–we’ve known exercise is good and Twinkies are bad for us, yet behavior change remains a tricky business. It keeps heart surgeons and Hostess in business. But hit someone between the eyes with a story that touches their heart–about a grandfather who adores his grandchildren but now sits on the sidelines in a wheelchair watching them laugh and play, unable to walk for more than a few blocks because of complications from a heart surgery that might have been avoided altogether had he just lost those thirty extra pounds–well that tells a little more compelling story than obesity statistics.